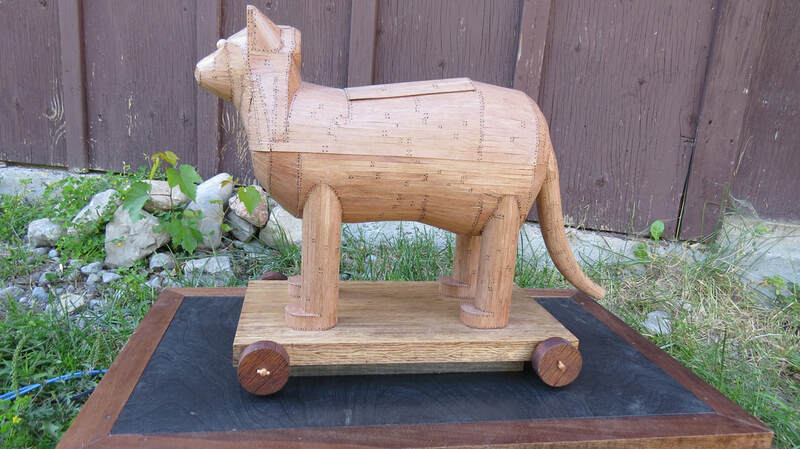 The Story of "The Trojan Cat"
I had thought that a whimsical variant on the story of the Trojan Horse might make an interest project. The challenge would be to hide part the mechanism in the body and the legs, driven by an another actuating mechanism in the base. Originally I experimented with a wooden, hand-driven reversing mechanism, but it was a suitable configuration or dependable. Ultimately I swallowed my ideals and decided that some form of automation might be better suited. I opted for an Arduino board to control motors and servos to move the characters. Turns out i'm not as clever as I thought and at the time of this web page posting, the Trojan Cat is still not programmed a totally independent operation. So if you are an Arduino specialist looking for a fun project, give me a shout!